Authorities have released the name of the police officer who did not recognize a colleague during a chaotic gunfight and fatally shot him after a man opened fire outside a police station in Landover, Maryland. A bullet from the gun of Officer Taylor Krauss struck and killed 28-year-old Officer Jacai Colson, Prince George's County Police Chief Hank Stawinski said Wednesday. 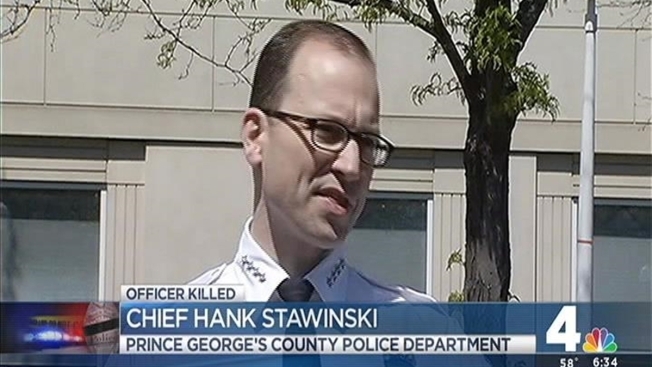 Stawinski called the five-year police veteran a good officer and said he was once named officer of the month, News4's Tracee Wilkins reported. "From the very beginning, Officer Krauss perceived what turned out to be Detective Colson as a threat and was trying to mitigate that threat that he perceived against fellow police officers," Stawinski said. "That led him to take the action that unfortunately resulted in this friendly-fire death." Michael Ford, 22, is accused of opening fire outside the police station after he told his brothers, Malik and Elijah Ford, he wanted to attack police. Stawinski said the three suspects put Krauss and other officers in a bad situation. "What the Ford brothers precipitated was a tragedy involving some of the finest officers on the Prince George's County Police Department," the police chief said. During the exchange of gunfire that followed, Colson was shot by a fellow officer who did not recognize him and viewed him as an armed threat, police said previously. Colson, an undercover narcotics officer, was dressed in plainclothes and stepped out of an unmarked car. The Ford brothers were ordered held Wednesday on second-degree murder charges after a judge found probable cause to keep them behind bars. Police have said Malik Ford, 21, and Elijah Ford, 18, helped their brother Michael before and during the shootout and used their cellphones to record video of the gunfight. Elijah Ford allegedly recorded his brother's "last will and testament" minutes before Malik Ford drove them to the Prince George's County Police Department's District 3 police station. The Chief calls Krauss a good officer, once officer of the month. He says the Fords put him and other officers in a bad situation. Michael Ford asked his brother Malik to send video of the attack to the entertainment website WorldStarHipHop.com, a detective testified Wednesday. He then began firing at the building and at passing drivers, causing officers to return fire. "They were hoping that there would be some sort of notoriety that would come out of this," Prince George's County State's Attorney Angela Alsobrooks said. Michael Ford's lawyer, Keith Lotridge, said the case is more complex than what police have presented. "This is a tragedy and there is more to this case than what we've heard," he said. Benjamin Evan, who represents Malik Ford, said he will argue his client was not involved in a plan to shoot anyone. Evan said he did not believe there was probable cause for his client to be held. "We don't believe that there was sufficient evidence for a judge to specifically find probable cause for the felony charges facing Malik Ford," he said. Elijah Ford's lawyer was not immediately available for comment.